Jazz Apples Dotsie Bausch took the final stage of the Tour de Whiterock in an emphatic solo victory today while Duvnjak won the kick to secure the top two spots in stage and the overall. Half way through, Bausch confided in Pryde that she felt that she was floating on her pedals and was at the ready for a launch for a team mate. While Basuch swept all the QOM points, Pryde then launched Bausch with two laps remaining who went to a sole victory. Olympian and Webcor rider, Erinne Willock initiated a furious chase and onslaught of attacks but Duvnjak checked her every move. In the final advance for the line, Duvnjak stormed up the finish hill ahead of the six remaining chasers to steal second prize. Her second place determined Marina as the clear winner of the overall Tour, and a stand out perfomer in the BC Superweek Series. On stage, Duvnjak took a moment to humbly complement the competition and praise the swelling crowds for their incredible support throughout the racing in true professional style. The women’s race, which consisted of eight laps around the larger – but no less grueling – 10.1 kilometer circuit. After staying together most of the race, Jazz Apple’s Dotsie Bausch, a two-time US National champion who won the Hillclimb Friday, broke away in the third-to-last lap, and quickly opened up a 30-second gap. Bausch finished in two hours, 33 minutes and 13.30 seconds, almost two minutes ahead of teammate Marina Duvnjka, who won a sprint for second just ahead of Amy Herlinveaux of the local Trek Red Truck Racing team. Knowing Duvnjak was behind her – not to mention several others from a dominant Jazz Apple squad – made it easier for Bausch to attack early, especially with Duvnjak marking Canadian Olympian Erinne Willock. “I have 100 per cent trust in those girls and Marina’s whole job was to sit right on Erinne, which is a compliment to Erinne because no doubt that she was the one we needed to watch her to win the bike race,” said Bausch, who marked Willock as Duvnjak won Saturday’s criterium. As a team, the New Zealand based Jazz Apple had plenty left in the gun. 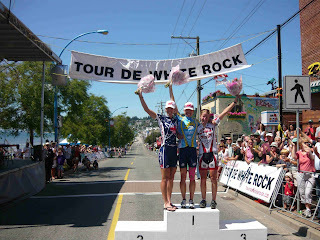 Duvnjak, who was also second to Bausch in the Hillclimb Friday, won the Tour de White Rock Omnium, or overall, title. Bausch was second. For Willock, who didn’t have any teammates from her Webcor Builders Pro team on hand, it was frustrating being a target. But the Olympian also knows it’s good for cycling in BC and Canada to have Jazz Apple here. Dotsie Bausch left Louisville for college nearly 20 years ago. She came back this week to compete — triumphantly — in the sport that helped save her life. Bausch won both her races in the USA Cycling Road Masters National Championships. When she crossed the finish line of Thursday's 25-mile race in the Churchill Downs infield, Bausch pumped her fist with more gusto than usual. "Redemption," she said of fighting through an occasionally frustrating race. But she could have been talking about her life, which is truly a redemption story. Before Bausch took up cycling 11 years ago at age 25, the only race she was winning was the one to the grave. She joined the Villanova University rowing team as a sophomore but tired of the 4:30a.m. wakeup calls and gave up the sport the next year. She kept eating like an athlete, though, and her weight ballooned. So she cut back on food severely, triggering a long struggle with eating disorders. There was an upside to being thin: She worked as a model in Philadelphia and New York for three years. The downside of this glitzy life was the easy availability of recreational drugs, including cocaine. Between the eating disorders and the drugs, she said, "It was a big old mess." She was so deep inside the mess that she couldn't see out. Her parents, Margie and Paul Cowden, saw and tried to help. They eventually got her into an outpatient program for the eating disorders. Regarding the drug use, she recalled: "I kicked that myself." Regarding her parents' unwavering effort to help her save herself, she said: "I felt ‚Ä¶ not deserving. I think that you subconsciously try to push them away, because you don't want them to hurt any more. And I figured that I was not going to make it. ‚Ä¶ I would eventually die." Before she could die, she realized this: "The most selfish thing in the world would be to not make it, because of my parents and what they've done." Over five years, she was treated by four doctors. Despite her difficulties, she functioned well enough to move to Los Angeles and work in television news. In California, where everything is supposed to start, something ended: Dotsie's fight against food. "My therapist (Dr.KRS Edstrom) saved my life," Bausch said. "She was really intense. She used a certain type of meditation therapy. I did the work, but she led me there." Incidentally — or perhaps not — Bausch took up bicycling as she got healthier. "I decided to just to try cycling as kind of an outlet for part of my healing," she recalled. Friends invited her to train for an AIDS benefit ride from San Francisco to Los Angeles. She eventually became a star in her sport, winning a bronze medal at the 2007 Pan American Championships. She has acknowledged she may have traded one addiction for another, cycling. "I've learned that I have an addictive personality, and I accept myself as I am," she once said. "I have picked a healthy addiction"
She doesn't speak of her former self as a stranger or an enemy. "That person," she said, "definitely defines a lot of who I am now, taking life one day at a time, enjoying life so much deeper because I know how fragile it is. "It wasn't too far from near-death. I was really, really sick. And if I had continued on that path, I wouldn't be here anymore." That young woman who courted death does sound long-ago-and-far-away when her mother speaks. "I think of Dotsie as full of life," Margie said. "She makes you laugh and glad to be alive." C. Ray Hall can be reached at (502) 582-4662. Education: Ballard High School, Villanova University (communications, philosophy). Family: Husband, Kirk, also a top-level Masters series racer; parents, Paul and Margie Cowden; sister, Megan Dietzel, president of Dotsie's Internet business, Hibiscus-Sunglasses.com. Jobs: Coaches 18 cyclists-www.empowercoachingsystems.com; advises New Zealand's professional development cycling team. High-profile cause: Speaking to audiences around the world about eating disorders, which threatened Bausch's life when she was in her 20s. In former lives: Rode show horses in Kentucky; modeled in Philadelphia and New York; worked in television in Philadelphia and Los Angeles; produced commercials and music videos. Philosophy student: "I liked learning to think in a different way.". Model: "Still, to this day, I really like high design, high fashion, and can really appreciate the artistry to create something that nobody's created before. The designers are artists. (Modeling) didn't seem strange to me. I loved it. I still love the industry and follow it.